Gary Bettman says next year's NHL salary cap is projected to be $71.5M. "The managers learned the upper limit of the salary cap for the 2015-16 season will be $71.4 million, with the lower limit $52.8 million." Essentially, $10.2m to re-sign Hayes, Connolly, and a backup G. I really hope they move Kelly, because that gives them a lot of flexibility to bring in a top-4 defender. Solid deals: Hayes for 3 yrs/$2.3 AAV, Connolly for 1-year/$1.025. 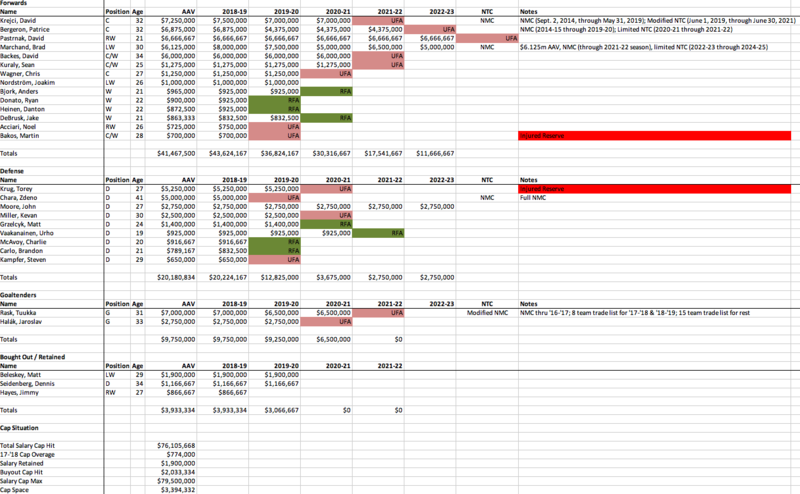 Bruins have about $5 million in cap space remaining. I have approx. 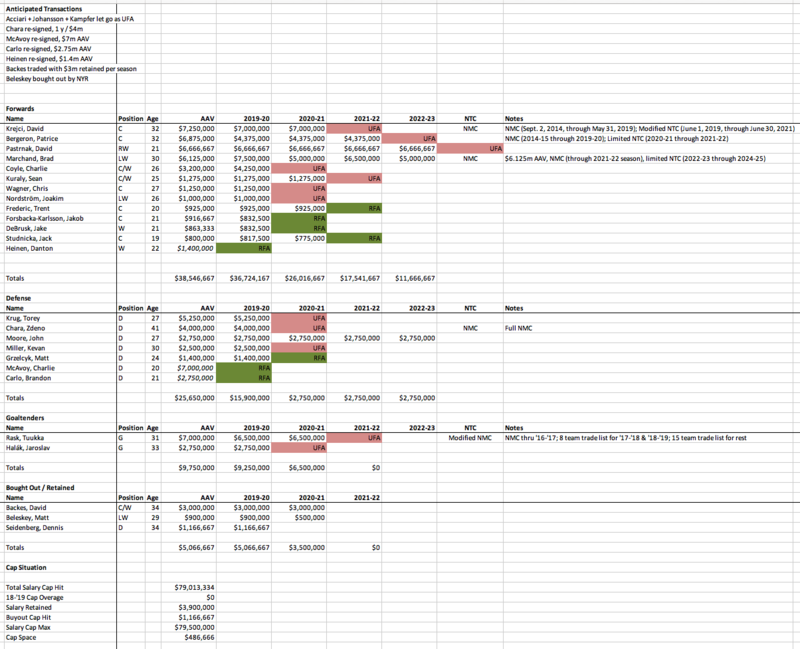 $2.55mm in cap space which is consistent with PSK's table above. By my scratch math- Bruins have about $5.5M in space left. Top-4 D, backup G with NHL experience most pressing needs going into 15-16. The Bruins now have approximately $66,435,667 committed to 20 players for 2015-2016 (inc. Pastrnak/Smith), also inc. overages & Lucic. I'm counting 23 players, as is PSK. The three last min deals are approx $2.2-2.4 mm, depending on which combination of players you use. Obviously, the Bruins can use those slots for upgrades. I'm with Amfox's $2.55m - not sure where Kirk's getting the add'l $3m in space fro. If you expose Ferlin to waivers or send Kemppainen down, you've got another $875k/$700k respectively, but not seeing much else. General Fanager has them at $5.56mm in space. Kirk may be getting the number from there. The discrepancy appears to be that GF's figures do not include Ferlin, Kemppainen or a back-up goalie. Ah - they also don't include a 7th defenseman, I've got Morrow breaking camp with the team. I would kill any two of you for the Bs to be able sign Kopitar. As that roster stands - and if those estimates are close to accurate on aggregate - the B's would have just over $9m in cap space to fill the 3rd line LW and upgrade the roster, so seems like they'd be able to make some noise in the UFA/trade markets next summer if need be. Those look reasonable to me. 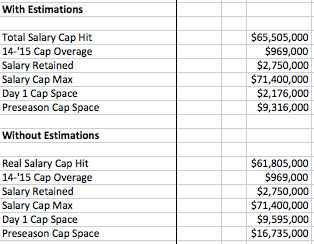 The big unknown is how much the cap will grow vs. high talent player salaries. Will guys like Kopitar and Stamkos (if unsigned) go for a little or a lot more next year. This year was useless since there wasn't any high end UFA talent really available. 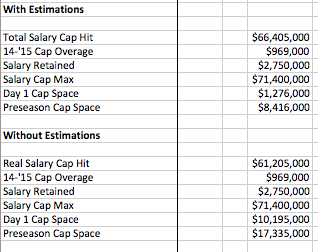 Stastny got 7M from the Blues and he's great, but not the player that Kopitar or Stamkos are (and was older last year than Stamkos will be next year), so I have to figure those guys both get significant raises. Stamkos should be looking at Kane/Toews money at least. The Canadian dollar just hit a 6 year low, trading at about 77 cents. ​It was trading at 93 cents this time last year. Supposedly the 7 Canadian teams generate roughly 1/3 of the revenue for the NHL. Things can change over the next year, but this doesn't bode well for much of a cap increase (if any) in 2016. It was $0.93 USD to $1 CAD this time last year, but not long past this point, the Canadian dollar hit a nosedive, so I think the bulk of the US gains/Canadian losses were reflected in the 2015-16 cap. Just as important was the slide the CAD took at the end of 2013. That the loonie briefly rebounded last year isn't as important as the fact that this it's generally been in the neighborhood of $0.80 for almost two years now. From the fall of 2009 until last fall, it hadn't traded below 90 cents. It started to really sink in the fall of 2014 when the bottom fell out of the oil market. 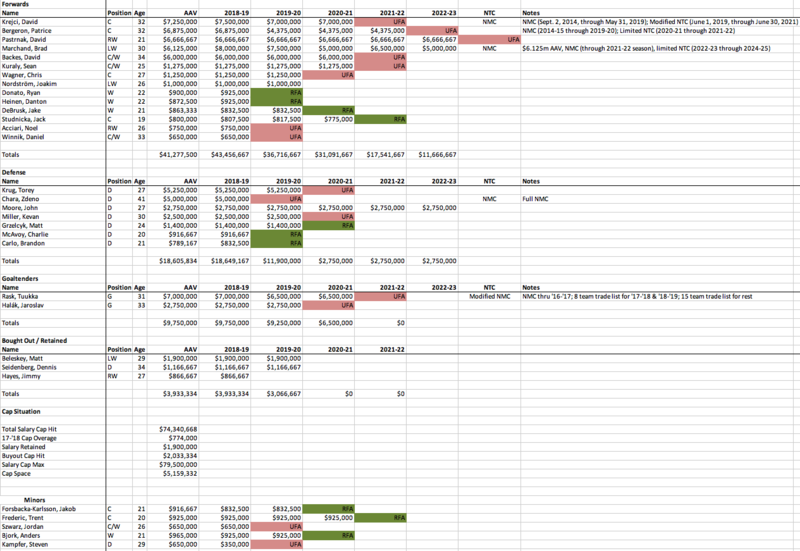 Here's an update in light of the Backes, Liles, and Khudobin signings. I'm guessing they sign 1-2 more forwards, as this has Heinen starting the year with the team due to Krejci's recovery from hip surgery. Vesey isn't looking quite as sure as a month ago so I haven't penciled him in, pretty much have $7.5m to play with to swing a trade for a D upgrade and round out the forward roster. Projections for RFAs are for AAVs and are in italics. How much can we afford to pay Pasta? 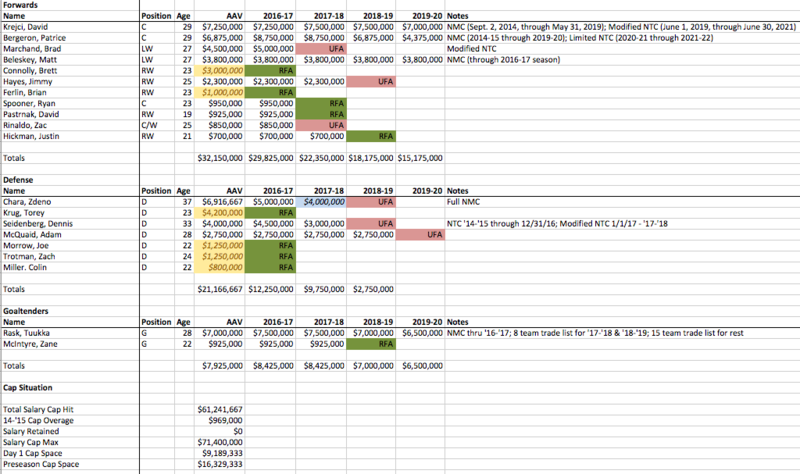 - Replacements or extensions for Moore (UFA), Czarnik, Acciari, and Schaller (all RFA). - Replacements for Lilles (UFA) and Morrow (RFA). Of the 7 non-Pasta RFA/UFA's, I'm sure some will be replaced by guys on ELC's, others on vet minimums, and others may be extended. If we assume an average cap hit of $1M for those 7, that leaves probably about $5M for Pasta, which still leaves a small amount of breathing room for in-season pickups and anything I likely missed. Bottom line: Spooner is likely gone. And if the cap decreases we're really screwed with regards to Pastrnak. Don't forget that if the B's don't qualify for the playoffs Sweeney may be gone as well. Hayes going to Providence doesn't help the B's by more than league min + $375k in terms of cap space. Hat tip to Dom Tiano, he relayed the point that there is no escrow in the AHL, meaning Hayes saves $368k (and costs the Bruins that amount supplementally) in real money. 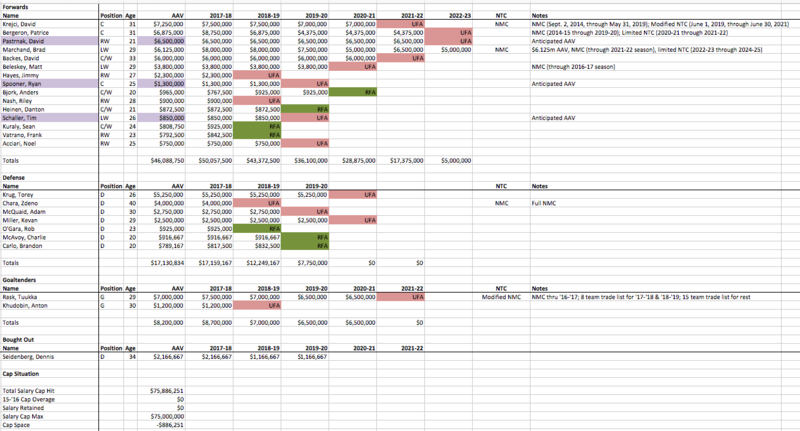 Minimal shot he gets sent down rather than bought out - if he's still around post-expansion draft, the B's can execute a later buyout by taking one of their RFAs to arbitration, then buying Hayes out during the second buyout period. His buyout cap hits would by $566,667 ('17-'18) and $866,667 ('18-'19) - well worth it rather than having $1.3m on the cap in Providence, IMO. Basically, they'll have whatever they need to re-sign Pastrnak assuming the cap doesn't implode. Sending Hayes to Providence and calling up O'Gara on day 2 makes them cap compliant. Thanks for the update, was thinking about this the other day. That's not a bad squad. 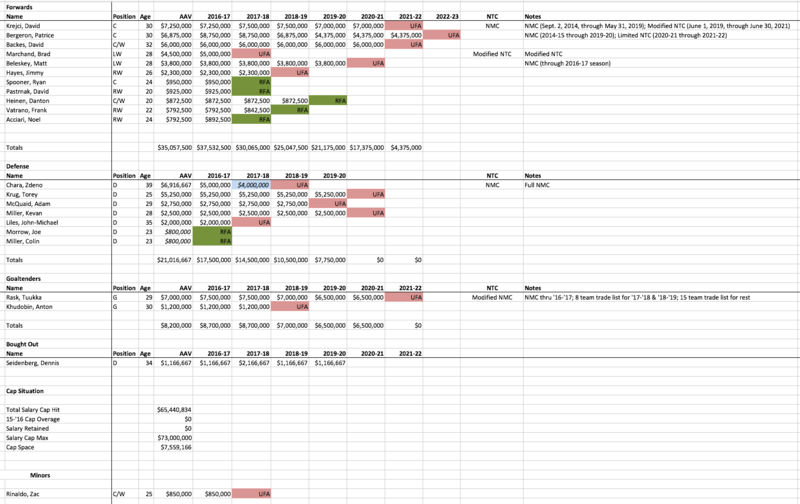 Although the Backes and Krejci contracts make me cringe. And Beleskey, woof. Moving one of the defensemen out. Signing Moore at a sub-$3m AAV is good business IMO given the B's are in the driver's seat cap-wise. I'm not adverse to moving Krug if a 30 G winger is coming back. Clarity on Backes. Our intrepid reporters haven't had a peep on his condition in two months, and $6m going on LTIR would be a huge deal for the cap picture. If NYR buys out Beleskey, that cap hit goes down, right? 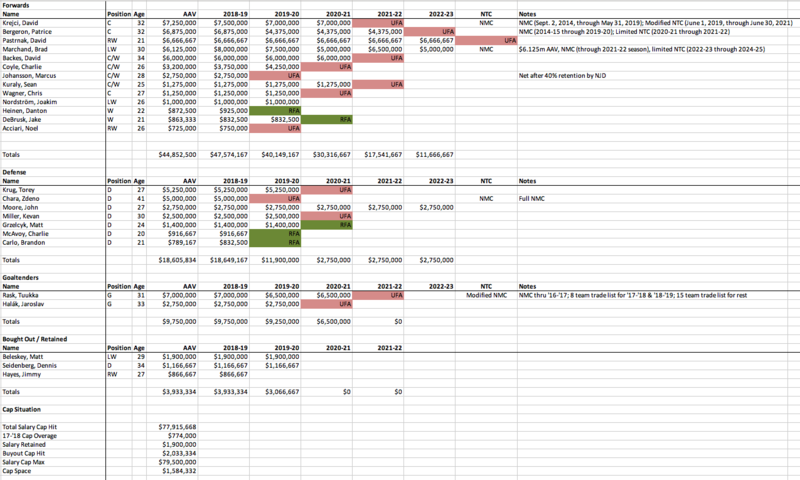 That retained/buyout salary number is tough to take. Yeah it goes down to $483,333.33 per year spread out over 4 years if NYR buy him out, $1.416m AAV savings for the Bruins. I wouldn't be shocked if NYR bought him out and are just pushing the decision to do so as far out as possible, given they have 6 arbitration-eligible RFAs remaining. The deadline to file for arbitration is 7/5, which takes the extended buyout period into August (I think August 4 is the final day for arbitration cases, depending on the number of filings). I think the Rangers just ride it out with Beleskey. They are rebuilding and have ~$24 million in cap space at the moment. Hayes, Skjei, Spooner and Vesey and a backup G will take up some/most of that money when they sign, but the Rangers still should have a good chunk of available space. It probably makes more sense for them to run the contract out, especially if they have thoughts of buying Brendan Smith out either now or after the season. They have the financial ability to bury Beleskey back in the minors if they need to clear a roster spot. Good call above on Beleskey, and an update after the McQuaid trade today. 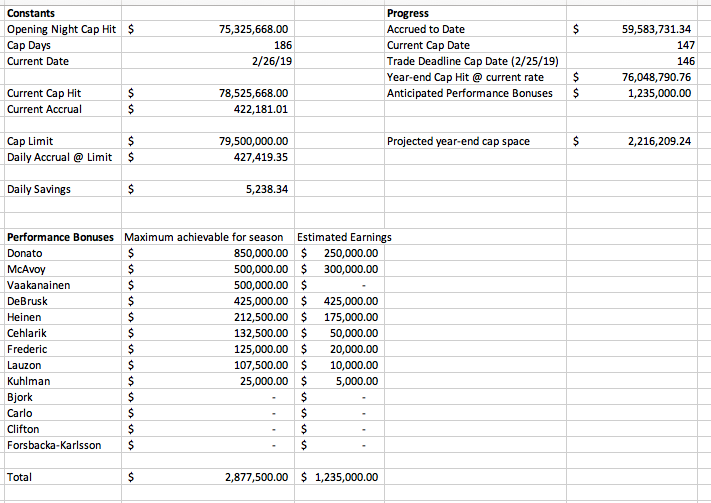 Cap hit is $76,105,668 right now, with ~$3.4m in cap space. That would prorate to >$10m come deadline day.